Is apple juice safe for diabetes? 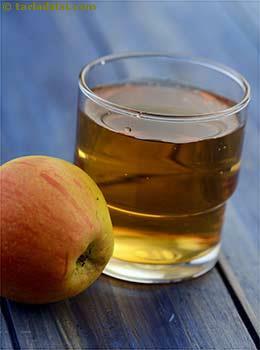 Apple juice is produced by the crushing of apples, and then is filtered extraction of the clear juice. It is a very clear liquid from which the pulp has been removed. The glycemic index of apple juice is estimated to be around 41 which falls under low GI range. Compared to the whole fruit apple, the glycemic index of apple juice is higher as it is highly processed. This is because the entire pulp has been strained .i.e. the fiber content becomes negligible and it’s just sugar what is left inside giving empty calories. Thus affecting your blood sugar levels significantly. Hence choose apple fruit as a whole over apple juice. Is apple juice suitable for weight loss? No, apple juice is not a nutritious and preferred option for the weight watchers as compared to the whole fruit. The fiber content in the making of apple juice is totally lost and all that is remaining is pure calories. When you are on a weight loss diet plan, you should aim at cutting down on simple carbs which easily gets converted into glucose and releases into the bloodstream. Thus makes you feel hungry more often. How to get the best benefit of your juice? If you still wish to pick apple juice over apple, to get possible benefits, avoid straining your juice and try to incorporate pulp as well or you can also combine your pulp with low GI food such as milk and have it as apple milkshake which is the best alternative for strained apple juice. Avoid adding sugar in the juice to cut down on more carbohydrates and calories. However, try not to peel the apple while making juice or having it as a whole fruit because it contains maximum amount of fiber. Choose homemade juice preferably over juices sold in local markets.